After an interlude from riding along disused railway lines, normal service resumed and I rode the rail trail of the day, the Downs Link. The full route is 37 miles from Shalford, near Guildford and runs all the way to Shoreham-by-Sea on the Sussex coast. 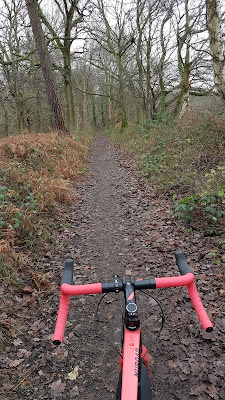 I joined it from about two-thirds of the way down at Copsale, after having done a very pleasant ride along a bridleway through St Leonard's Forest. Having done the Downs Link in the past, I knew what to expect - a long straight path mainly through forest and at short intervals passing through villages. The main difference this time around was that the surface was a bit wetter and muddier than in the past. 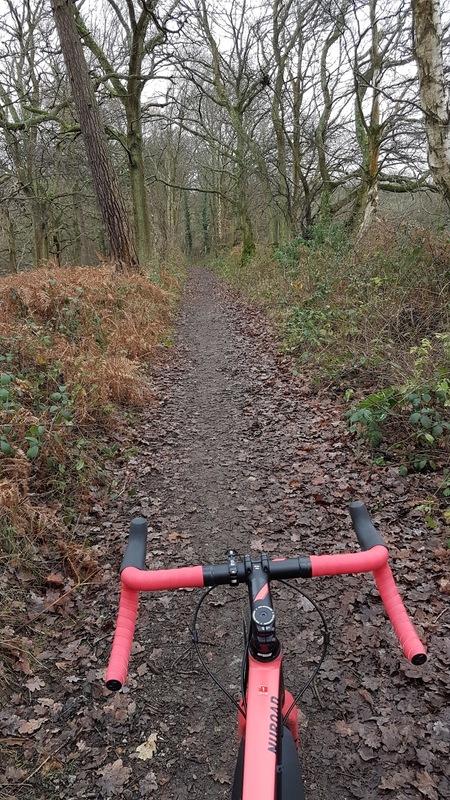 That was not a problem for me though, as it meant that the trail was a bit more comfortable to ride than the bumpy ride that I usually get when going over the stony path in the summer. 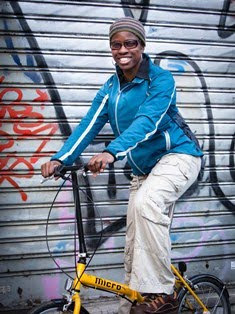 There were lots of folks out riding, especially kids on what was probably their Christmas present. I like this time of year because people seem so much more care-free. One little girl who can't have been more than 7-years old, smiled at me as she passed, saying "Happy Boxing Day". That made my day. Although there were quite a lot of people out, the refreshment stops at West Grinstead and Partridge Green were closed. Everyone needs a holiday, I guess! My arrival run into the coast was nice and flat. When riding to Brighton, I usually have to go over a climb like Ditchling Beacon or Devil's Dyke. 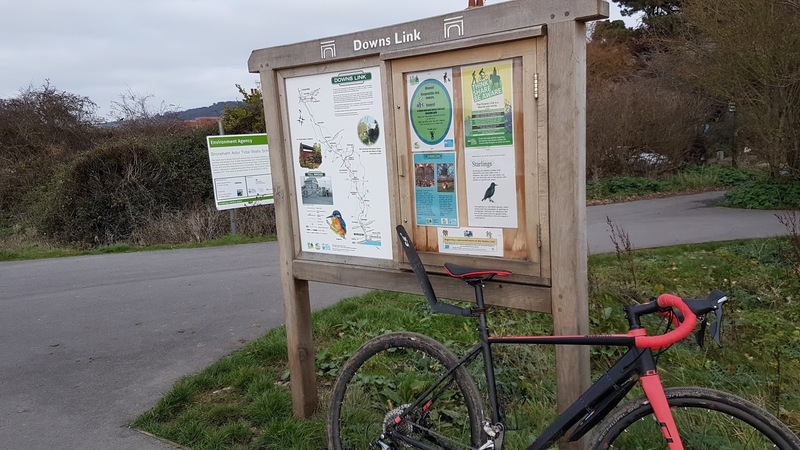 In fact, the first time I rode on the Downs Link I got a bit bored of the flat unchallenging stuff and diverted onto the South Downs Way at Bamber to go up Edburton Hill. 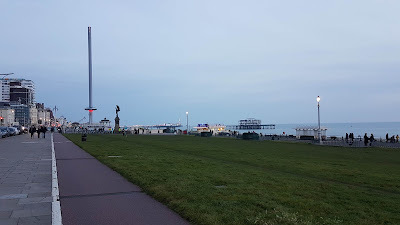 Today, was feeling much too sensible to do such a crazy thing, and kept to the text-book flat route all the way to Shoreham, before riding along the tarmacked traffic-free path along the coast from Portslade to Brighton. 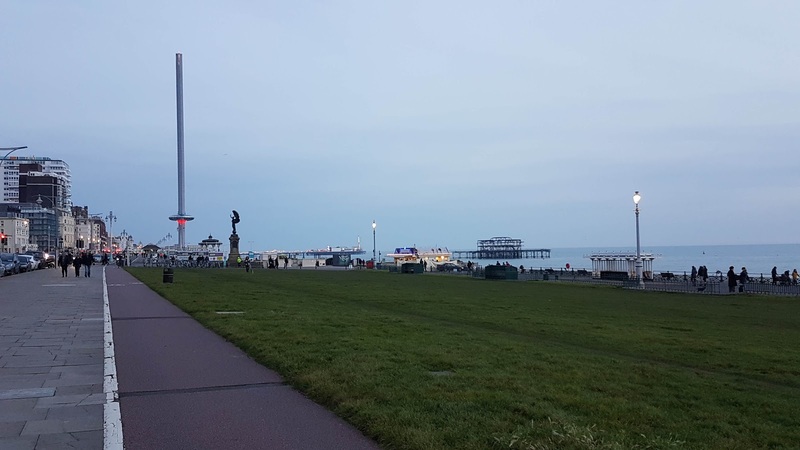 Because I had started my ride so late it meant that by the time I arrived in Brighton it was dusk, and I ended up riding back to my car (which was parked in Colgate) in the dark. The route back was signposted, (I followed the signs for Crawley) and took me on paths and country lanes that went parallel to the A23 trunk road. And then nearer to the end of the route I was on empty country lanes above the M23 motorway. Thankfully, my USE Exposure Lights, were pretty powerful, and when on the empty, pitch black country lanes the roads were perfectly visible. I also wore a Proviz 360 jacket which is totally reflective at night. So I didn't feel vulnerable at all. Being in the dark when there's no one around feels great. I felt so free and it was really peaceful. Only the sound of the natural night life, and the creatures running out of the way could be heard as I zoomed past the trees. I need to do this sort of thing more often. Maybe I'll do another night ride tomorrow.